Sculpture class... the idea this time was to create a hybrid animal by using the one we'd been studying earlier (that's my raven/crows) combined with one or two others. Corvus type bird + iguana = the Corguana. Cours de sculpture : l'animal fantastique, cree a partir du melange de l'animal deja traite en cours (le corbeau) avec un ou deux autres... moi ca donnait le "Corguane". 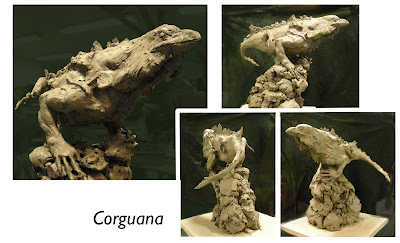 photo reference for raven and iguana, clay sculpture approx 50cm long. Oh my goodness... GREAT CREATION! I can't wait to take fantasy sculpture at my school.